Rimfire 258 Studio - WIFI, Ski in ski out, perfect location for your village stay, heated underground parking. 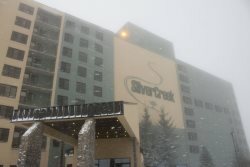 LARGE ROOM, INTERNET, HOT TUB IN COMPLEX, SKI IN SKI OUT, RESTAURANTS AT YOUR DOOR! Silver Creek 1104 Studio. Cute and cozy home away from home for your vacation! This studio condo is tastefully decorated and is located in the heart of the village.